This insulation at a low price for thermal and sound insulation of the house. The most inexpensive Styrofoam of all brands. Most often used in insulation and sound insulation of garden houses, indoors, temporary and outbuildings. The most affordable polystyrene foam insulation. Polystyrene foam insulation with price per sheet in our online store. The heater from foamed polysty.. Expanded polystyrene in sheets of various sizes. 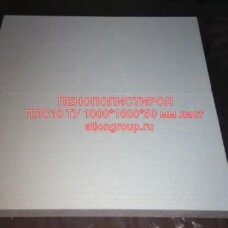 Expanded polystyrene sheet-one of the most common b..